Asthma is a chronic inflammatory disease and affects the air passages which carry air from the nasal area and the mouth to the lungs. People suffering from asthma find it difficult to breathe outside and therefore feels congested and suffocated. It can happen in all age groups, from toddlers to 50 year old men. Asthma does not have a cure, but adversity and symptoms can be suppressed with procedures and treatments. It can, however, flare up at any time and any day. The correct medications will depend on individual health conditions and things such as age, asthma triggers and symptoms and so on. When taking any medications, you should follow the instructions. 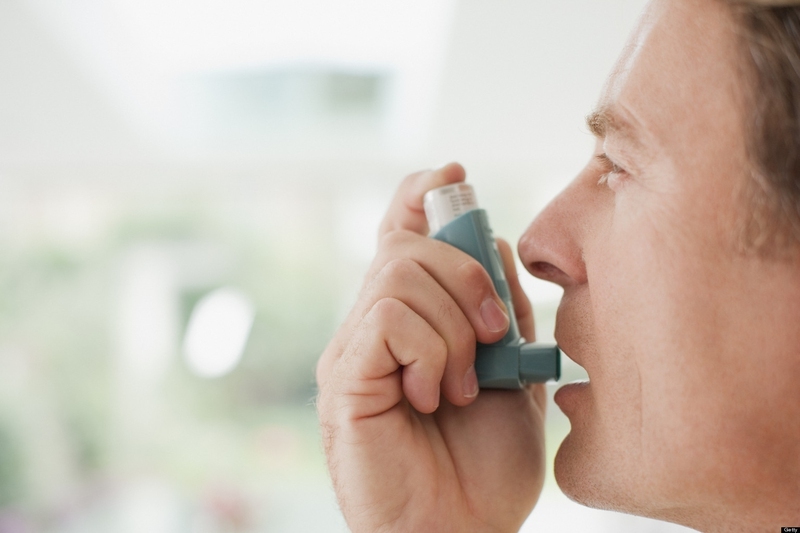 Long-term preventative control medications soothe your asthma by lowering the inflammation in your airways. Bronchodilators, or Quick-relief inhalers, open up your swollen airways quickly. Sometimes, allergy medications such as Omalizumab or Xolair are needed. Before you take any medication, consult with your doctor. You naturally become more anxious when an attack begins, which makes it more difficult to breathe. Breathing exercises can help you calm when asthma attacks and lower the frequency and severity of the attacks. Lie on your back on a mat or carpet and put a book on your stomach. Inhale deeply and gently, but don’t expand your chest but your abdomen instead. Focus on the book. If it's rising up, you are breathing correctly. When you feel you are at full capacity, take in a bit more air and see if you can raise the book up a bit higher. Gradually exhale, counting to 5 slowly. The more you exhale, the more relaxed you will feel. Repeat this 5 times or more. There are some old home remedies for asthma which can give relief from the mucus and phlegm which block your airway and makes it difficult to breathe. Use ghee or mustard oil and add rock salt to make a paste. Rub this on your chest during an asthma attack. Or, add camphor oil to mustard oil and massage your chest with it. This will help loosen phlegm and help you breathe smoothly. Alternatively, warm sesame oil and add some salt into it. Massage your chest with this to help loosen phlegm. Doing this after steam inhalation will be even more beneficial. Omega-3 fatty acids which can be food in flaxseed, walnuts, Brussels sprouts, kale and spinach help stop the actions of body compounds which create inflammation in the airways. Evening primrose oil is full of an essential fatty acid known as GLA. It can be used by the body as anti-inflammatory substances. Bioflavonoids are compounds which give vegetables and fruits their color and have powerful anti-inflammatory and anti-allergenic properties. Quercetin, one type of bioflavonoids, can stop the release of histamine. Turmeric is a yellow cooking spice which is great at suppressing inflammation. Put 1 teaspoon of turmeric powder in warm milk and drink this 3 times per day. Asthma home remedies include steam inhalation, which can loosen phlegm that tightens your chest and makes it hard to breathe. When you combine natural ingredients to your hot water, you will benefit even more. You make your natural steam inhalation at home by adding caraway seeds into boiling water or putting a few drops of juniper oil/peppermint oil in hot water. Ginger is well-known among the home remedies for asthma for its ability to lower inflammation in airways and stop airway contraction. Mix same amounts of honey, ginger juice and pomegranate juice. Consume a tablespoon of this mixture 2 to 3 times per day. You can also mix a teaspoon of ground ginger in one and a half cups of water and take a tablespoon of this before bed. Or cut an inch of ginger into small pieces and steep in boiling water for 5 minutes. Let it cool and then drink it. Alternatively, detoxify your lungs by making a fenugreek decoction. Put a tablespoon of fenugreek seeds in boiling water and mix a teaspoon of honey and a teaspoon of ginger juice. Drink this each morning and evening. You may also eat raw ginger which is mixed with salt. Honey is one of the oldest home remedies for asthma. The ethereal oils and alcohol in honey help lower asthma symptoms. For some people, just inhaling honey’s scent has positive results. You could also mix a teaspoon of honey in hot water and drink it slowly 3 times per day. Before bed, swallow a teaspoon of honey with a half teaspoon of cinnamon powder to take phlegm out of your throat and let you sleep better. Do not smoke and avoid others who do because cigarette smoke will irritate your airways. Don’t stand close to a wood-burning stove or fireplace. In cold months, wrap a scarf around your mouth and nose to warm the frigid air before inhaling it. Be aware of triggers like foods with strong scents or perfume samples in magazines. Do what you can to avoid them. Eat more frequent, smaller meals and do not eat before bed. The reflux of stomach acid can create heartburn and trigger an asthma attack. Around 5% of people with asthma are allergic to NSAIDs, or anti-inflammatory drugs such as ibuprofen and aspirin. Taking these drugs may trigger an attack. Use acetaminophen or another aspirin-free pain reliever in this case. A peak flow meter is a portable, inexpensive, hand-held device which is used to measure how fast air comes out of your lungs when you forcefully exhale after fully inhaling. This is called the peak expiratory flow, or PEF. By keeping track of this you will know if your asthma is in control or getting worse. If it is getting worse, this is a signal that you should call your doctor right away. You should also develop a plan to regulate your asthma. It not only tells you what worsens or soothes your asthma, but also includes your routine asthma symptoms, what you need to do when asthma attacks or when you experience an emergency.